LiveCode LessonsLiveCode LessonsHow To - Step-By-Step Guides To Tasks In LiveCode Creating User InterfacesHow do I use a Progress Bar? 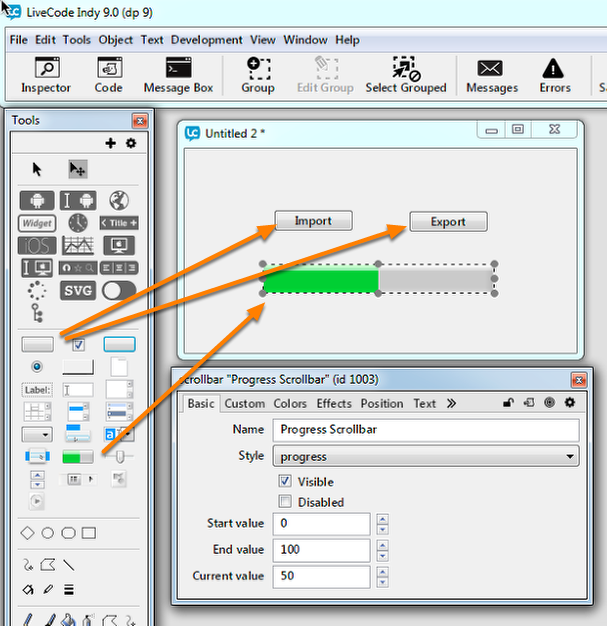 Learn how to use a progress bar while importing or exporting a file. Sample code is provided. Progress bars are often used to provide a graphical indication of an action measured against time for an ongoing process, such as when transferring files. Here we demonstrate how to implement a progress bar that can be used when importing and exporting a file. Create a new main stack with two buttons. One button should be labeled Import, the other button should be labeled Export. Then add the progress bar. In a working application, it may be more appropriate to add the file selection dialog, rather than the Import and Export buttons. The properties of the progress bar are widely configurable. By default the range is set from 0 to 100, with the current value set to 50. For the purpose of this lesson, set the current value to 0. This allows the progress bar to be updated with percentiles. Note: A range from 0 to 100 is convenient if the percentage values are to be displayed in numerical terms next to the progress bar. Much of the code in this example is used to determine the size of the file. The repeat loop then reads in the file in 1024 character chunks until the end of file (eof) marker is reached. As the file is read, a counter is incremented to keep track of the amount of data transferred. That value is then used to update the current value of the progress bar. filter tFiles with URLEncode(tFileName) & "*"
repeat while tReadResult is not "eof"
As the file is already in memory, it is not necessary to calculate the download size. The export process writes to the file line by line from the internal memory buffer. The progress bar should be working now. Use the Import button to load a file into memory and use the Export button to write the file back out to the file system. check that you changed the filepath to the file you are importing to something valid on your computer. You can't import Dave's actual file :). Great Stuff - takes the mystery out of file copies with a progress bar. Allows us to give that professional look to a file copy. what do i need to do to fix the problem and what is the problem. I am new to coding and am struggling to fix it on my own. If you use libURLDownloadToFile to download your file you can use libURLSetStatusCallback to set a status message to be sent periodically while the file downloads. This message is sent with a parameter that inlcudes the status, downloaded bytes and total bytes which you can use to update a scrollbar.